The whole rattle is shown here. U. S. Light-House Establishment Night Watchman’s Rattle. A Night watchman’s rattle was an instrument having at the end of a handle a revolving arm, which, by the action of a strong spring upon two wooden cogs, produces when rotated in motion, a loud, harsh, rattling sound. 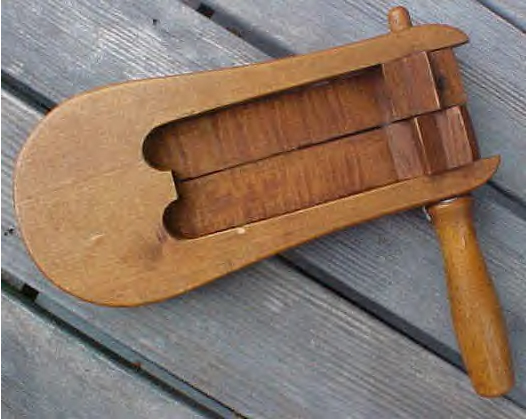 In this case the rattle is almost entirely constructed of hardwood - maybe maple or walnut. Connected to the wooden handle are two wooden cogs, which beat against two wooden reeds. When the watchman needed to gain attention he would grasp the handle and rotate his hand briskly, causing the rotating cogs to strike the reeds, making a loud noise. The sound created was quite distinctive and would summon aid from the area. This is one of the few that has survived today used by the U.S. Light House Establishment. Each depot might have one or two rattles available for the watchman to carry. As you can imagine, watchmen in the Lighthouse Establishment were relatively few and to find such an item, which we can attribute directly to them is most unusual. This one remains unusually clean and is in excellent condition, still operational. 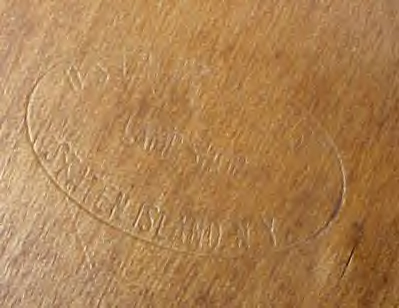 A close up of the Depot stamp, slightly hard to see in the grain of the wood without altering the photo somewhat.